I truly identify with this post. About fifteen years ago, I started being sick. This was accompanied by a terrible (and I mean terrible) pain in my nose. I had two teeth extracted. It didn't stop the pain. I was still sick . . . for days on end.
. . . long story . . . it's a facial migraine caused by wheat and gluten intolerance. This intolerance has now spread to dried fruit, marmite (! ), chocolate . . . oh and all sorts of things (including some cheeses) and there are foods too which I didn't realise contain gluten until they started making me ill - like malt vinegar. I'm glad I worked out what was causing the trouble and feel embarassed that I used to imagine food intolerance was a fad. I also wish I didn't have to explain you really can have a migraine in your nose. Hope life is easier now you know what's been zapping you. Wow, that's very interesting, I got a terrible migraine once after eating a pizza, maybe it was Parmesan, sometimes I try to blame it on chocolate, either cereal, ice, cream, or a candy bar, but I can't usually explain it. I actually reduced my headaches extremely by moving away from the major stress source of my parents! My grandmother also commented that she had headaches from age 5 until age 55, approximately menopause. Well, I guess no headaches and no periods are something to look forward to when I'm old! The menopause is great for getting rid of headaches. And those awful bad tempered feelings - all gone now, no more PMT. It is interesting about food intolerance's - I think they also have more effect when we are run down, stressed etc - when we are top form - our body seems more able to cope. Those migraines are awful :( My husband's are trigger by certain kinds of lighting and bright sunlight. Now that he can work from home things are better. His office is a windowless room and he doesn't even turn on the lights! Sounds terrible, but it seems to have helped him. It's amazing how foods can cause such terrible symptoms! Hopefully you've found the cause. Nitrites (used to preserve meats) are a very well recognized cause of migraines. 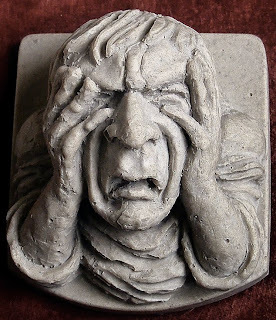 Oh Esther, facial migraine sounds horrible (and no Marmite - that's just tragic!). Fancy having to lose teeth unnecessarily, too. Nasty.